Update: Microsoft Listened! The Windows 10 Creator’s update has fixed this issue! Okay, so I wasn’t sure how to title this article. However, I will endeavor to explain my frustration I am having with Windows 10’s VPN settings. Whenever I click the network icon in Windows 10, it will bring up my local connection, WiFinetworks, and VPN connections. When I select my VPN connection instead of being able to connect directly from the first network setting list I get directed into the Settings app in Windows 10. Connect is “Missing” underneath my VPN connection on Windows 10. From the Settings app in Windows 10, I can then select my VPN connection and click connect. I know this may sound quite trivial but it is a frustration especially since it feels like we took a step back from Windows 7 and Windows 8. Here are the steps to accomplish this. Step Six: Type in your username and save your changes. These changes should take place without having to reboot. 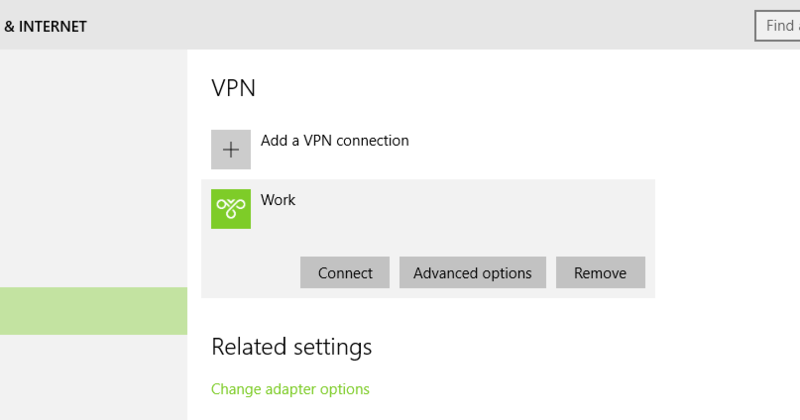 Now when you click the network connections icon you will get a Windows 8 type network menu that allows you to connect to your VPN connections. The way it should look! I think this registry edit is awesome! However, I don’t think we should have needed to do it in the first place! Please, Microsoft add this functionality back into Windows 10. I will keep you posted if I find a better solution. This was posted by techspeeder. Please consider following my blog or my twitter feed. This entry was posted in Tips and tagged Network Settings, VPN, Windows 10 on September 15, 2015 by Merlin Halteman. Once again, Thank you very much for posting this. You said this has been fixed in the Windows 10 Creators update, however this doesn’t appear to be the case. I’m running Win10 Pro; version 1709; Buid 16299.98, and this lack of “Connect” button is still as issue for me. My VPN profile was built with CMAK and deployed via GPO, so perhaps this is the reason it’s still not working.